BARBERVILLE, Fla. - Feb. 12, 2016 - In front of one of the largest crowds in DIRTcar Nationals history, Kasey Kahne Racing's Brad Sweet and Daryn Pittman fought a pitched battle for the season opening World of Outlaws Craftsman® Sprint Car Series feature on Friday night. When the checkered flag fell, it was Sweet who took the win. "It feels good to win any of these Outlaw races," Sweet said. "This is my third season, so I understand how grueling these years are and how important it is to start the year off strong. I also know that just because you win tonight doesn't mean anything for the future. We just have to keep digging and hopefully this is our year to win a lot of races." Pittman took the first quick time of the season in his No. 9 Great Clips car as the series implemented a new format. Sweet and Pittman started side-by-side in the 30-lap main event at Volusia Speedway Park. As the green flag fell, Pittman and Sweet battled as Greg Hodnett rolled into the third position. Sweet got around Pittman on lap six as the two drivers made their way into lapped traffic. In spite of a 17th place starting position, Donny Schatz was the driver on the move as he powered his No. 15 Bad Boy Buggies/Chevrolet Performance car through the field. By lap four he had moved into the top-ten and nine laps later he was in the top five. On lap 13, the field reset from a caution with Sweet leading Pittman and Hodnett - Schatz was in fourth. On the restart, Pittman battled past Sweet as Schatz moved into third and then got around Sweet on the exit of turn two as the two drivers made lap 14. Through the succeeding laps, Pittman and Schatz battled wheel-to-wheel for the lead - each driver using every inch of the track in search of the fast line. On lap 20, disaster struck for Schatz. The reigning series champion's car slowed as it entered the back straight and then lost power into turn three. An engine issue ended Schatz's night, his first DNF since September, 2013. As Schatz faded away, three-time series champion Sammy Swindell was on the march. From fifth on lap 20, he passed Greg Hodnett two laps later to take over the third position. The battle though was back up front as the teammates continued to fight for the lead. More wheel-to-wheel action continued through the closing laps as Pittman held on to the lead. With lapped traffic in play, Sweet and Pittman made the final circuit. Sweet got the run off of turn two and passed Pittman onto the back straight. Sweet drove his No. 49 car across the line in first. "I'll tell you what, we definitely needed that lap traffic," Sweet said. I was pretty calm and I knew that nine laps was just long enough that we could maybe get some lap traffic and the track stayed pretty fast but it was still pretty racey. There was two grooves. I know Daryn was searching for the right spot and I was searching. You know sometimes it's better to be in second in those situations." "Daryn did a great job, you know. It's pretty awesome for Kasey Kahne Racing to be battling for first and second. I know what it's like to lose on the last lap. I've won some like that; I've lost some like that. Hats off to those guys, they did a great job all night." For Pittman, the frustration of losing the lead on the final lap was tempered by the fact that it was his teammate who got around. "It is what it is. At the end of the day I got out-drove," Pittman said. "My plan was just to run the top the last nine laps, and that didn't work out because he about passed me on the restart. I went back to the top and I actually got off two pretty good every lap except the white flag lap. I got way too high and lost my speed and saw him going down the backstretch underneath me and I knew we were in trouble. Hats off to him, that's a great team. If we're going to lose to somebody I guess that's the team we want to pick to lose to." Swindell, running a scattered schedule with CJB Motorsports in 2016, got his best finish of DIRTcar Nationals Friday night. "I kind of got a little fouled up on the start there with David when he had a problem. I thought he was taking back off and I got behind him, and then I went back to 12th," Swindell said. "This has been a blessing for this to come along for me at this age. After last night, we had some issues so we sat down as a team and made some really good decisions and changes for tonight. I look for us to have a really good season because this is a great bunch of guys to work with." Paul McMahan was the night's KSE Racing Hard Charger, advancing 12 positions to finish in ninth. The World of Outlaws Craftsman Sprint Car Series returns to action on Saturday for night five of DIRTcar Nationals at Volusia Speedway Park. RACE NOTES: Brad Sweet became the first winner of the World of Outlaws Craftsman® Sprint Car Series season… Donny Schatz's streak without a DNF ended Friday night at 178 races. 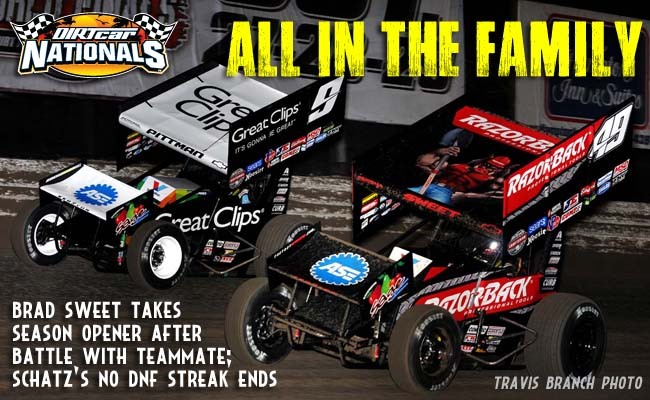 His last DNF came in September 2013… Daryn Pittman scored the first quick time award of the season on Friday night… Paul McMahan was the night's KSE Racing Hard Charger, advancing 12 positions to finish in ninth. CONTINGENCY WINNERS - MSD Ignitions ($25 cash): David Gravel; MSD Ignitions ($50 cash): Brad Sweet; Sweet Manufacturing ($50 cash): Daryn Pittman; Penske Shocks ($50 cash): Jason Sides; Mobil 1 ($50 cash): Jason Sides; JE Pistons ($50 cash): Jason Sides; Lincoln Welders ($50 cash): Kerry Madsen; VP Racing Fuels ($50 cash): Kerry Madsen; Edelbrock ($50 cash): Paul McMahan; Comp Cams ($50 cash): Chad Kemenah; Cometic Gasket ($50 cash): Joey Saldana; Super Flow ($50 cash): Greg Wilson; Craftsman/Sears ($100 cash): Greg Hodnett; Sweet Manufacturing ($50 product certificate): Brad Sweet; KSE Racing Products ($100 product certificate): Paul McMahan; Comp Cams ($50 product certificate): Brad Sweet; Mobil 1 (20% off Mobil1RacingStore.com): Terry McCarl; JE Pistons (Set of Rings): Shane Stewart; JE Pistons (Set of Rings): Terry McCarl.